Reds Ankle & Foot Associates (Wayne) - Book Appointment Online! 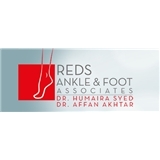 Welcome to Reds Ankle & Foot Associates, your experienced Ankle and Foot Surgeons in Wayne & Saddle Brook, NJ. We hope you find our website informative and helpful as you search for an Ankle and Foot Surgeons you can trust. We're confident you'll find an unmatched quality of care from the foot and ankle specialists at Reds Ankle & Foot Associates. We offer a full array of podiatry services including Foot and Ankle Surgery, Plantar Fasciitis, Diabetic Foot Care, Laser Treatment (for lower extremity pain and/or nail treatments), and Wart Treatment.